Canberra offers a plethora of tourist attractions, with Tidbinbilla Nature Reserve a perennial favourite for locals and visitors alike. It is a beautiful location for hiking and provides the opportunity to observe our native fauna and flora up close. Due to its distance from central Canberra, it is often up to Canberrans to introduce Tidbinbilla to their guests for the first time. Federal governments have also made the most of the Reserve, escorting a number of visiting dignitaries to Tidbinbilla for a uniquely Australian experience. 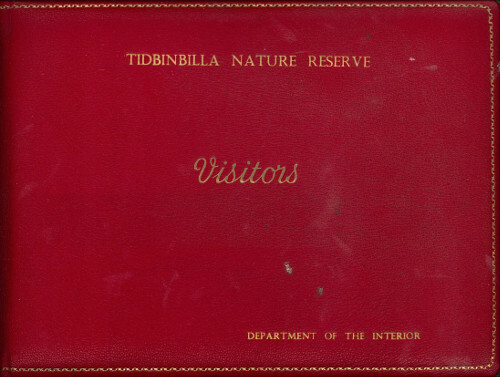 Tidbinbilla has a number of visitors books stationed around the Reserve. However, one special book was kept exclusively for VIPs. Inside its covers are the signatures of royalty, celebrities, political leaders and their partners; it is a veritable goldmine for philographists! While many of these special visitors were in the media's spotlight during their stay, some passed through Canberra relatively unnoticed. This book documents a brief part of their time in the National Capital. The Tidbinbilla Nature Reserve Visitors Book 1970 - 1986 is ArchivesACT's July Find of the Month. You can download a PDF copy of the Tidbinbilla Nature Reserve Visitors Book here: ( PDF 2.52Mb) and a translation of the book is available here: [ Word 200Kb]. 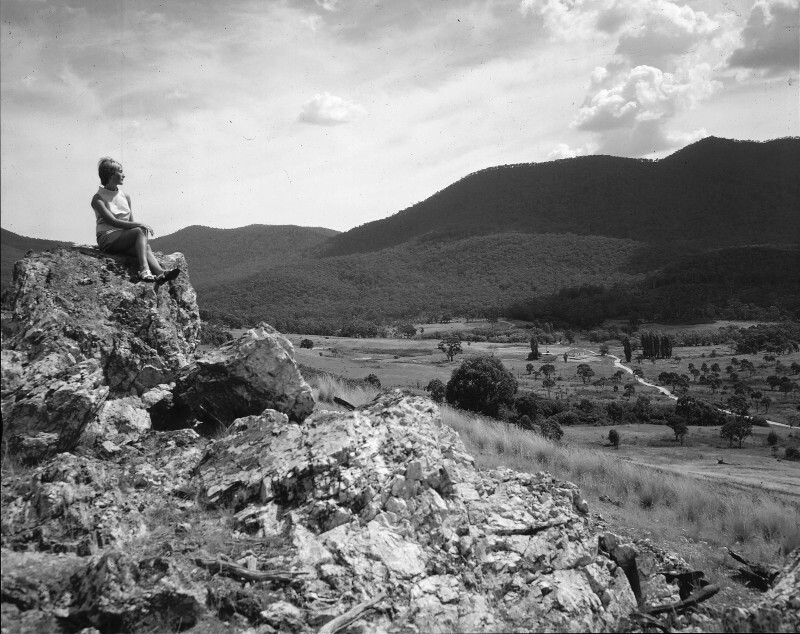 In 1936, the Canberra branch of the Royal Society suggested that the Department of the Interior (DOI) establish a flora and fauna reserve within the Tidbinbilla Valley. Following investigations of the area, the DOI set aside approximately 809 hectares at the head of the valley for this purpose. However, the onset of World War 2 prevented any further development of the area. During the 1950s, the Royal Society again approached the DOI and suggested reserving the whole Tidbinbilla Valley as a native fauna reserve. After much consideration, the DOI agreed, adding an additional 3237 hectares to the original reserve area. The Commonwealth acquired the land in 1964 and immediately stationed a ranger to begin rehabilitation and development work. From the creation of the ACT until 1964, most of the Tidbinbilla Valley had remained in private ownership. Three generations of farmers had used the valley for cultivation and grazing, and most of the work during the late 1960s involved restoring the valley to a native state. The DOI worked to eradicate noxious weeds, rabbits, foxes and feral cats from the area. They also demolished sixteen kilometres of dilapidated fencing. By 1970, the DOI had constructed three large compounds for emus, kangaroos and waterfowl, and established bird-feeding tables. Newly constructed public facilities included the first stage of a Visitors Information Centre, walking trails and barbeque areas. By the early 1970s, visitor numbers to Tidbinbilla were consistently over 100,000 people per year. Due to the large area of Tidbinbilla Nature Reserve, visitor books are placed in a number of locations to monitor hiking groups by recording details such as car registrations, party numbers, destinations, and departure and return times. By recording this information staff are aware of any overdue hikers and the number of people who may require assistance during an emergency. The leather bound, gold embossed Visitors Book featured here serves an entirely different purpose - a record of famous and influential people who visited Tidbinbilla. 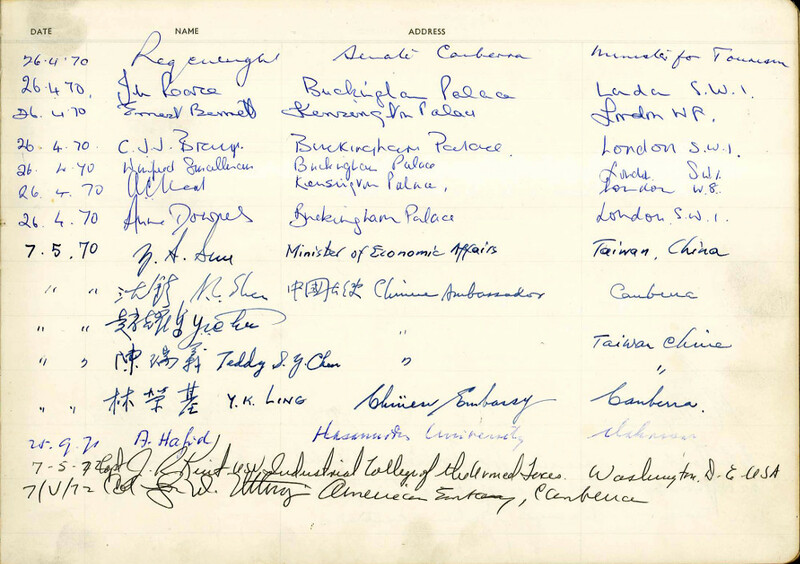 The first entries in the Visitors Book coincide with the 1970 Royal Tour of Australia. To celebrate the bicentenary of Captain James Cook's arrival in Australia, the British Royal Family toured Australia during April and May that year. Queen Elizabeth II participated in three major events held in Canberra during the Tour. On the 25th of April the Queen participated in the Anzac Day march ceremony at the Australian War Memorial. Later that day, she formally inaugurated the Captain Cook Memorial at Regatta Point and switched on the Captain Cook Memorial Water Jet. The next day saw the Queen busy handing over the British Government's bicentenary gift to Australia, the Carillon. While the Royal Family were attending to these duties, the Minister for Tourism, Senator Reginald Wright, took members of the Royal Household staff on a tour of Tidbinbilla. Included in the group was Ernest Bennett, the Queen's "first and longest serving page." His official title was Page of the Blackstairs and his duties involved serving the Queen's meals and drinks, dealing with her domestic arrangements and looking after the Royal corgis. The following month saw a delegation from the Republic of China (Taiwan) visit to Tidbinbilla. Taiwan's Minister for Economic Affairs, Sun Yun-suan, and his colleagues were in Australia to attend a three-day economic conference with the Australian Government, seeking cooperation to build an integrated steel mill in Australia. This visit occurred just prior to a turbulent period in Australia's political relationship with Taiwan. At the time, Australia did not recognise the People's Republic of China (mainland China) and had maintained an embassy in Taiwan since 1966. 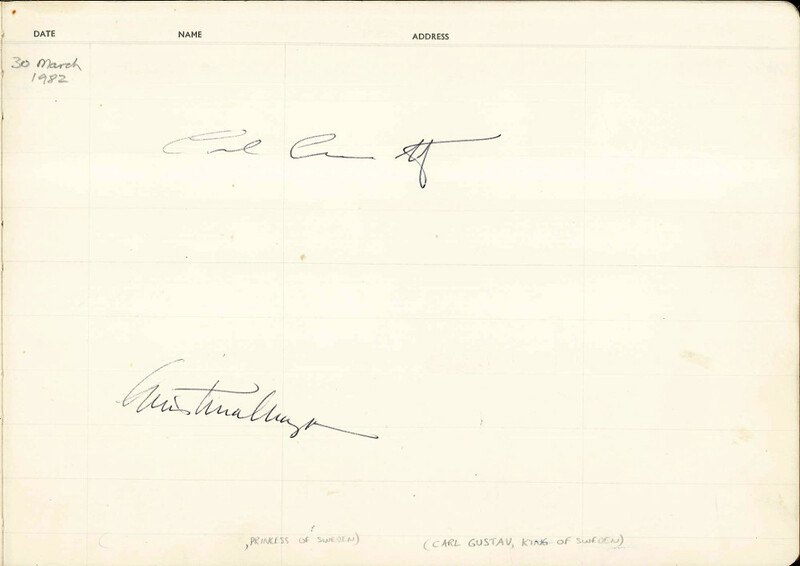 In December 1972, the newly elected Whitlam Government signed a joint communiqué establishing diplomatic relations with the People's Republic of China. At the same time, Australia removed its official representation from Taiwan, a situation that remains to this day. In October 1981, Australia hosted the sixth Commonwealth Heads of Government Meeting (CHOGM) at the Royal Exhibition Buildings in Melbourne. On the 3rd and 4th of October, Canberra's Lakeside Hotel (now QT Canberra) was host to the delegates and their spouses for a weekend retreat, providing the opportunity to experience the ACT. On the first day of the retreat, Tammie Fraser escorted Indira Gandhi and a group of First Ladies to Tidbinbilla Nature Reserve. 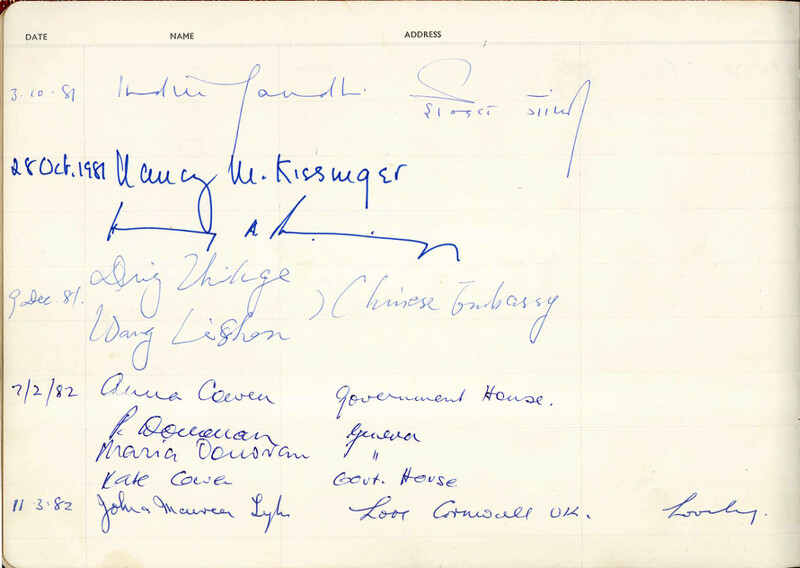 Several of the First Ladies took the time to sign the Visitors Book and write comments. Sarah (Hayfron) Mugabe, Robert Mugabe's first wife wrote, "What a lovely country with very pleasant people!" while Gladys Molefi Olebile from Botswana was, "Very much impressed by what I've seen." 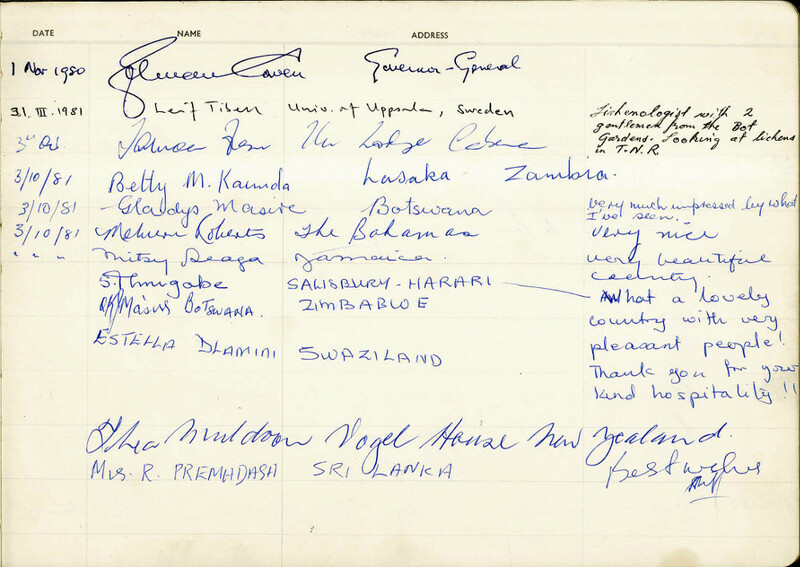 On the 28th of October 1981, Dr Henry and Mrs Nancy Kissinger quietly visited Tidbinbilla during their stay in Canberra. The former US Secretary of State was in Australia as a counsellor to the advisory committee of the American Chase Manhattan Bank. Also visiting from the Bank were Mr Willard Butcher and Mr David Rockefeller. They were meeting with Prime Minister Malcolm Fraser, Treasurer John Howard and other Ministers to hear about the findings of the Campbell inquiry into banking and finance. They also covered Australia’s mineral development and the world economy in these "friendly and constructive discussions." In February 1982, Francis and Maria Donovan were guests of Sir Zelman and Lady Anna Cowen at Government House. Francis Patrick Donovan was the Australian Trade Commissioner and Minister (Commercial) to the United Nations in Switzerland. His wife, Maria Kozslik Donovan was the author and illustrator of several popular cookbooks including Continental Cookery in Australia (1955), The Far Eastern Epicure (1958), The Blue Danube Cookbook (1967) and Astrology in the Kitchen (1971). On the 7th of February 1982, Lady Cowen and her daughter, Kate, escorted the Donovans around Tidbinbilla. March 1982 saw the "first State visit by a European monarch to Australia, with the exception of Queen Elizabeth." King Carl XVI Gustaf of Sweden spent two days in Canberra as part of his tour of Australia. He had previously visited the country as a naval cadet in January 1967, and later made a second state visit in November 2005. For this State visit King Carl's sister, Princess Christina, accompanied him, as Queen Sylvia was expecting their third child (Princess Madeleine). Sir Zelman and Lady Cowen hosted King Carl and Princess Christina at Government House during their stay in Canberra. The 30th of March was a busy day for the Swedish Royals. They inspected the new Parliament House site, visited the Australian War Memorial, lunched with Prime Minister Malcolm Fraser, and attended a garden party at the Swedish Embassy. Although not mentioned by the media, they also managed to find time to visit Tidbinbilla, as evidenced by the Visitors Book. In June 1982, the US Ambassador to Australia, Robert Dean Nesen, escorted Shirley Temple Black and her husband, Charles Alden Black around Tidbinbilla. Shirley Temple Black was in Australia to film a television interview with Michael Parkinson. A former child movie star who appeared in over 40 films during the 1930s and 1940s, Shirley Temple Black began an active political career in the late 1960s. She served as the US Representative to the 24th United Nations General Assembly in 1969. She also served as the US Ambassador to Ghana (1974-1976) and Czechoslovakia (1989-1992). "Ambassador Shirley Temple Black breezed into Canberra for what is sadly a typical American visit — a here-today-gone-tomorrow stopover that leaves everybody gasping." 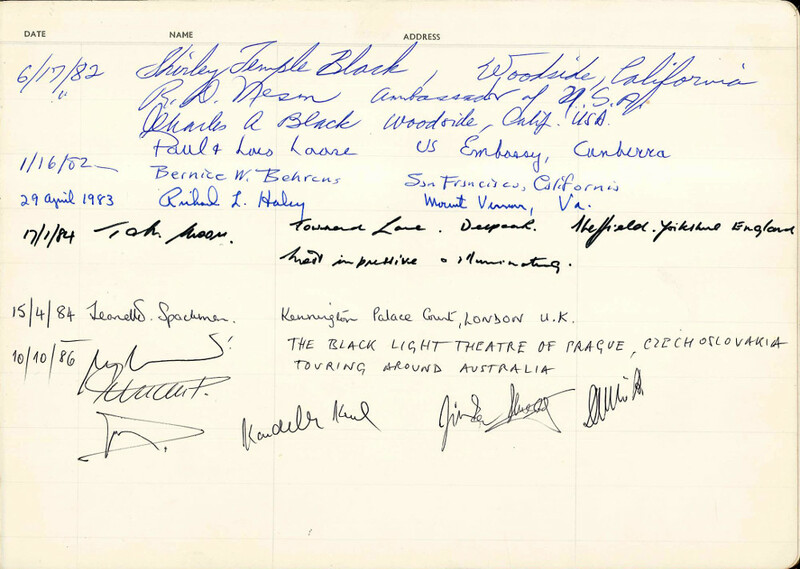 The final entries in the Visitors Book are for members of the Black Light Theatre of Prague who were performing at the Canberra Theatre during October 1986. Established by Jiří Srnec in 1961, they still perform today as the Black Light Theatre Srnec, and lay claim to being the first black light theatre in the world. Black light theatre uses "black curtains, a darkened stage, and "black lighting" (UV light), paired with fluorescent costumes in order to create intricate visual illusions." The video 'The Best of Black Light Theatre - Black Light Theatre of Jiri Srnec' provides an overview of this art form. The Tidbinbilla Visitors Book provides a small window on Australia's international relations in the 1970s and 80s. It gives us glimpses of the relationships we thought were most important to us, glimpses that the newspapers sometimes missed. Some of those relationships endure, and some have changed fundamentally since those times. From royals to writers, from ambassadors to actors, from the 1970s to today, Tidbinbilla offers us the chance to give our visitors that 'bush capital' experience they expect when they visit Canberra.